Gaming historian Jon-Paul Dyson began the Forgotten Tales session with a simple, famous quote: "Great artists don't borrow, they steal." Picasso once said this and it remains true. "The past can inform the present," said Dyson. This panel turned to the greats in the industry to find out their sources of inspiration and ideas they "borrowed" over time. Sims creator Will Wright kicked off the session with his favorite source of inspiration: Pinball Construction Set. Lots of early games were simulations of pinball games but Bill Budge was one of the first people out there to recreate the genre in a great way (with Raster Blaster). For Wright, it embodied three concepts that he kept to heart for future games - construction (designing and sharing is fun), systems (tweaking variables) and a fantastic GUI. Sid Meier, perhaps best known as the designer of Civilization, hopped up next to talk about Dan Bunten's Seven Cities of Gold and how it greatly influenced him as a game designer. Before Seven Cities of Gold, Meier produced Floyd of the Jungle. But afterwards came Pirates, Civilization and Railroad Tycoon. "It is a huge game. It is a game about the exploration of the American continent," said Meier. "Graphics were rudimentary, functional, but this was the revelation of the game - with the graphics power in those days, probably 1% of what we can do today, Dan was able to create this entire world you could explore. There's a lesson there for us - his willingness not to be constrained by any technical limitations...there's a message there, that's a real inspiration for me and other game designers. Games just didn't have to be about simple things in the arcade tradition that we started from. They could do totally amazing things. That's an interesting lesson for us today. Our games are 100x more epic and cool? I'd like to challenge us to think outside of the box the way Dan was able to in the day." Other lessons Meier included in future games was replayability through random maps, the use of mixed genres, an open world, and an emphasis on using your own imagination. The Legend of Zelda changed everything for Gears of War designer Cliff Bleszinski. "Zelda ignited my senses," said Bleszinski. "It had a sense of mystery, a sense of adventure and discovery. It was just pure magic for me at that point." He pointed out that the last game to successfully do this was Skyrim - that feeling of being in the woods, never knowing what you're going to find, and getting that sense of pure magic. When others ask him about his inspiration, Bleszinski tells them to think back to their childhood. "It's all there," he said. "All of these games, all of these feelings, that's where it's all from and it taps into that primal thing." 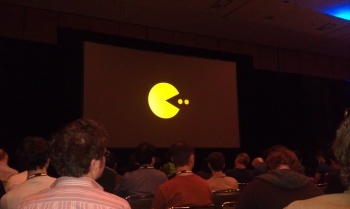 Lastly, John Romero took the stage to reveal that his biggest source of inspiration has been Pac-Man. "Pac-Man is the game that really blew me away and influenced everything because the game design was unlike everything that had come before," said Romero. "The four ghosts were crazy cool - they all had personalities and as you play the game, you learn them," Romero said. For example, Shadow is aggressive, Pinky and Blinky and Clyde all had names, alternate names in Japan, pet names, everything. There was a story even though there wasn't really a story there. And, more importantly, it was a game that was different than shooting aliens and driving cars. Spending at least $200 a month on the game, Romero got to the point where he could look away and successfully play through the first three screens. "I think you all know Pac-Man and how it works but it was very different when it came out. It was a mind blast for me," Romero said. Other games were mentioned throughout the panel but when it comes down to it, Meier and Wright were influenced by the early greats of Electronic Arts, Cliffy B grew up idolizing Nintendo, and Romero spent hundreds of hours and hundreds of dollars putting quarters into Midway's highest grossing arcade game. The greats were inspired by the greats.